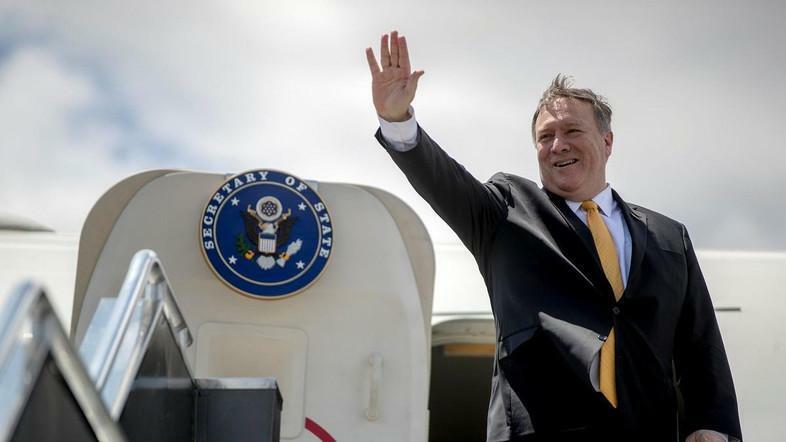 WASHINGTON, April 8 (Xinhua) -- U.S. Secretary of State Mike Pompeo will travel to Chile, Paraguay, Peru, and Colombia to discuss ties with these nations and Venezuela-related issues, U.S. State Department said here on Monday. Pompeo will travel on April 11-15 to "deepen U.S. partnerships in the Western Hemisphere" and "rally support for democracy in Venezuela," said a statement issued by State Department spokesperson Morgan Ortagus. Pompeo will also make a brief stop in Cucuta, Colombia, on April 14. Cucuta is on the border with Venezuela. Venezuela has closed its border with Colombia and announced the severance of his country's diplomatic and political relations with Colombia following the latter's support for Venezuela's opposition and military defectors. The United States has been pursuing a policy of economic sanctions and diplomatic isolation against the Venezuelan government in support of the opposition leader Juan Guaido. The Trump administration recognized Guaido as the nation's "interim president" on Jan. 23, days after incumbent President Nicholas Maduro was inaugurated for a second term. In response, the Maduro government severed "diplomatic and political" ties with the United States.